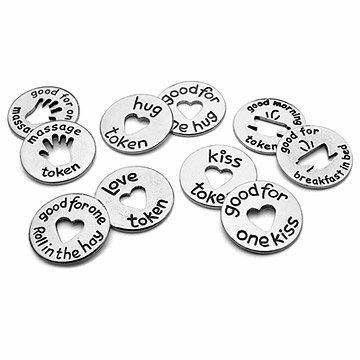 A set of ten pewter love tokens to give your sweetheart as tokens of your affection. Tokens come in nice black velvet bag and you get 2 of each of the 5 tokens. Really cute gift for my girl, she loved them! These tokens are great! Just as advertised. Well made in a soft black bag. Made her smile on Christmas! These are a nice and quality take on a timeless classic. My girlfriend loved these, she said she will definitely be using them throughout the new year. Very nice quality product, creative idea for a couples gift or in own relationship! And they did it again! Uncommon goods makes me look like a genius!! The uniqueness of the gifts I give score serious points with my loved ones. I bought these for a wedding basket and my boyfriend's christmas stocking.